One day, Oliver and Noah had descended into the kitchen at the usual dinner-hour, to banquet upon a small joint of mutton--a pound and a half of the worst end of the neck--when Charlotte being called out of the way, there ensued a brief interval of time, which Noah Claypole, being hungry and vicious, considered he could not possibly devote to a worthier purpose than aggravating and tantalising young Oliver Twist. Intent upon this innocent amusement, Noah put his feet on the table-cloth; and pulled Oliver's hair; and twitched his ears; and expressed his opinion that he was a 'sneak'; and furthermore announced his intention of coming to see him hanged, whenever that desirable event should take place; and entered upon various topics of petty annoyance, like a malicious and ill-conditioned charity-boy as he was. But, making Oliver cry, Noah attempted to be more facetious still; and in his attempt, did what many sometimes do to this day, when they want to be funny. He got rather personal. Oliver's colour rose as he said this; he breathed quickly; and there was a curious working of the mouth and nostrils, which Mr. Claypole thought must be the immediate precursor of a violent fit of crying. Under this impression he returned to the charge. 'What did she die of, Work'us?' said Noah. 'Better not!' exclaimed Noah. 'Well! Better not! Work'us, don't be impudent. Your mother, too! She was a nice 'un she was. Oh, Lor!' And here, Noah nodded his head expressively; and curled up as much of his small red nose as muscular action could collect together, for the occasion. 'What did you say?' inquired Oliver, looking up very quickly. Crimson with fury, Oliver started up; overthrew the chair and table; seized Noah by the throat; shook him, in the violence of his rage, till his teeth chattered in his head; and collecting his whole force into one heavy blow, felled him to the ground. A minute ago, the boy had looked the quiet child, mild, dejected creature that harsh treatment had made him. But his spirit was roused at last; the cruel insult to his dead mother had set his blood on fire. His breast heaved; his attitude was erect; his eye bright and vivid; his whole person changed, as he stood glaring over the cowardly tormentor who now lay crouching at his feet; and defied him with an energy he had never known before. Noah's shouts were responded to, by a loud scream from Charlotte, and a louder from Mrs. Sowerberry; the former of whom rushed into the kitchen by a side-door, while the latter paused on the staircase till she was quite certain that it was consistent with the preservation of human life, to come further down. 'Oh, you little wretch!' screamed Charlotte: seizing Oliver with her utmost force, which was about equal to that of a moderately strong man in particularly good training. 'Oh, you little un-grate-ful, mur-de-rous, hor-rid villain!' And between every syllable, Charlotte gave Oliver a blow with all her might: accompanying it with a scream, for the benefit of society. Charlotte's fist was by no means a light one; but, lest it should not be effectual in calming Oliver's wrath, Mrs. Sowerberry plunged into the kitchen, and assisted to hold him with one hand, while she scratched his face with the other. In this favourable position of affairs, Noah rose from the ground, and pommelled him behind. This was rather too violent exercise to last long. When they were all wearied out, and could tear and beat no longer, they dragged Oliver, struggling and shouting, but nothing daunted, into the dust-cellar, and there locked him up. This being done, Mrs. Sowerberry sunk into a chair, and burst into tears. 'Poor fellow!' said Mrs. Sowerberry: looking piteously on the charity-boy. 'What's to be done!' exclaimed Mrs. Sowerberry. 'Your master's not at home; there's not a man in the house, and he'll kick that door down in ten minutes.' Oliver's vigorous plunges against the bit of timber in question, rendered this occurance highly probable. 'Or the millingtary,' suggested Mr. Claypole. Noah stopped to make no reply, but started off at his fullest speed; and very much it astonished the people who were out walking, to see a charity-boy tearing through the streets pell-mell, with no cap on his head, and a clasp-knife at his eye. The story of the orphan Oliver, who runs away from the workhouse only to be taken in by a den of thieves, shocked readers when it was first published. Dickens's tale of childhood innocence beset by evil depicts the dark criminal underworld of a London peopled by vivid and memorable characters -- the arch-villain Fagin, the artful Dodger, the menacing Bill Sikes and the prostitute Nancy. 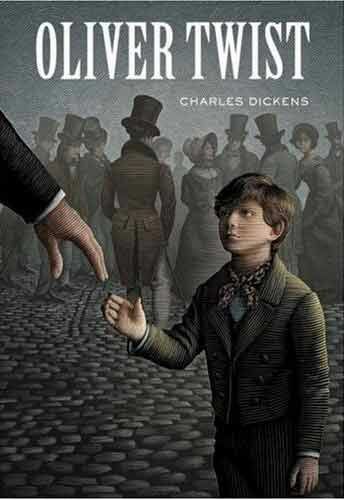 Combining elements of Gothic Romance, the Newgate Novel and popular melodrama, in Oliver Twist Dickens created an entirely new kind of fiction, scathing in its indictment of a cruel society, and pervaded by an unforgettable sense of threat and mystery.